If you’ve been reading this magazine for a while, you probably already know that my husband, Dave, and I met while he was fishing on the Ventura, California pier. Fishing continues to be one of our favorite family activities. I love the fresh sea air and the feeling of being on wide open waters. We love the challenge of finding the right spot, rigging up our lines, and the anticipation of luring the big ones to bite. One day about a month ago, the Pacific Ocean lay down flat, there was just a hint of breeze, and the sun shone through our winter clouds. We donned caps and warm layers of clothing and gathered up supplies — ice, bait, the fish cooler, fishing poles, and snacks — and launched the Olga out of the south-facing, wind-protected harbor at Brookings, Oregon. Within just a few minutes of lowering our lines, Sammy caught a small black rock fish…and in that same short amount of time I was already busy trying to unsnag my line from debris on the ocean floor. Bummer! After Dave motored the boat a few feet, my line loosened and I was able to reel up without losing the rig. I lowered it again until the weight hit bottom, then quickly reeled in about five feet so it wouldn’t snag again. Suddenly, Sammy caught another fish and I got a big bite. Sammy got the net ready but instead of one huge rock fish, I had caught two good-sized ones — one on each hook of my rig! Hurrah! Thank heavens Sammy had the net under those two big guys since my line broke as I brought them into the boat. We got the fish off the hooks and Dave took his sharp knife and cut through the gills and neck to “bleed out” the fish. This is an important step since the fish is a lot more flavorful this way. Soon, Dave caught a couple of blacks as well. A productive day on the ocean means fish for supper. After a while we decided to head home where Robby filleted our catch. That night I breaded the fish in seasoned cracker crumbs and fried it in hot olive oil. There was so much left over, I needed to think of a good way to use up that fish. When it’s breaded and fried, the fish isn’t as good the second day since the coating gets a bit soggy, so I got the notion to make a hearty fish chowder using the leftovers. I took the breading off, which my chickens thought was delightful. I found a recipe online and modified it to my liking. I wanted a lot more vegetables than the original recipe and I also incorporated a can of cream-style corn. I made this soup again just the other day in our magazine office for our staff and this time I added a big can of chopped green chilies. The chowder got a “thumbs up” from everyone. And if by some chance we get skunked on our future fishing trips, I might still make this hearty soup vegetarian-style. In a large skillet, heat 2 Tbsp. butter and 2 Tbsp. olive oil. Add onion, celery, carrot, peppers, squash, and mushrooms. Cook over medium heat until just tender. In a large stock pot, heat chicken broth, water, and bouillon. Add potatoes and simmer about 5 minutes. Add heated vegetables. Simmer another 5-10 minutes. In a mixing bowl add 2 cups of the milk and the flour. Whisk until the flour is thoroughly incorporated. Slowly stir in the flour and milk mixture. Add the rest of the milk. Then add the salt, onion salt, pepper, parsley flakes, and no salt seasoning blend. Stir occasionally and cook over very low heat for about 30 minutes until potatoes are tender. Add the cans of corn and green chilies. If the soup looks too thin, you can mix a tablespoon or two of flour with about ¼ cup of milk in a small bowl and slowly add to the soup pot and stir in well. In a small fry pan, heat remaining butter and olive oil. Wash fish fillets. Check and discard any small bones that might be left in fillets. Gently fry on medium heat on both sides about 2 minutes. Use a spatula to cut the fish into large chunks and add to the soup pot. Cook over very low heat about 15 minutes more, stirring frequently. About 5 minutes before serving, add cheddar cheese and gently stir well. Serve with more grated cheddar cheese, if desired. Some nice fresh dinner rolls will make this meal complete. I love trying new recipes for homebaked bread and rolls. I found the following recipe in my favorite bread machine book, Better Homes and Gardens Bread Machine Bounty. I modified the recipe slightly since their version calls for toasted wheat germ. I didn’t have any, so I substituted it with wheat bran. I also added a teaspoon of dried oregano since I thought the herbed bread rolls would go nicely with the soup. 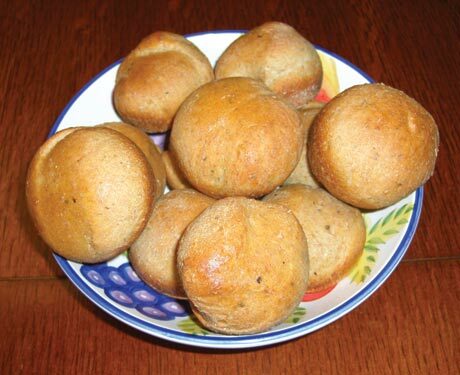 It’s hard to beat warm, fresh dinner rolls. In a bowl add milk, sour cream, honey, and butter. Gently warm in microwave. Stir to mix all ingredients. Add the egg and gently mix. In a separate bowl, add whole wheat flour, bread flour, salt, wheat bran, and dried oregano. Mix until blended. Add warmed liquid ingredients to the bottom of the bread machine pan, then add the dry ingredients. Make a small well in the flour. Spoon the yeast into the well. Place pan in bread machine and set to the dough cycle. When the dough cycle is done, take the dough out on a lightly floured board and gently expel the air. Grease and flour two muffin pans. Cut the dough in half. Set aside one of the halves. Cut one of the halves into 12 equal pieces. Grease hands with a bit of olive or canola oil. Roll each dough segment to form a ball and place in muffin pan. Repeat with the second half of the dough. Cover with a damp towel and let rise in a warm place for about an hour. Bake in a preheated 350° F oven for 12 to 15 minutes. Makes two dozen small dinner rolls.